DALLAS — On Tuesday morning, Dallas Stars head coach Lindy Ruff was scheduled to address the media at approximately 11:35 a.m. 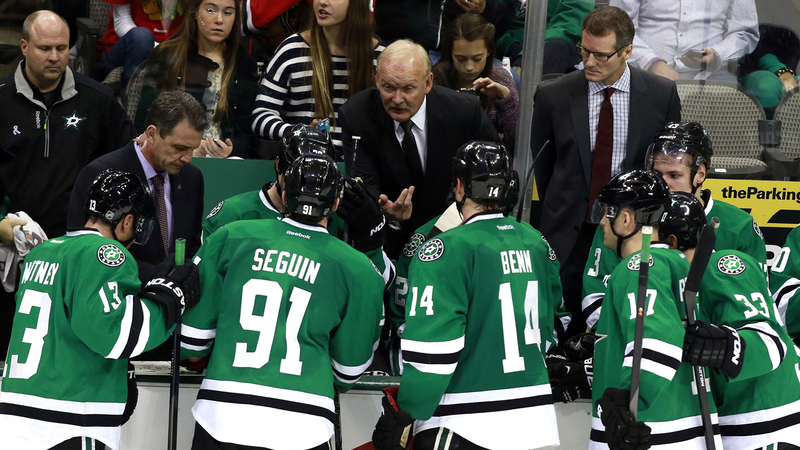 However, that exchange was delayed for about 20 minutes as Ruff called a meeting with the entire Stars roster and one also attended by Dallas general manager Jim Nill inside their locker room at American Airlines Center. Right before noon, Ruff emerged from the meeting to address the media and said the following about the meeting. "I called the meeting. It was good. I’ve been through stretches like this and it’s believing in your system, trusting in your system, it’s being able to trust the guy next to you," Ruff said. "The two words I look for and I want the players to dig down and grab are energy and emotion. I want to see energy and emotion tonight. And when the game’s over, I want them to be proud of the effort they put in and we’ll take the result after that." Dallas lost 4-1 to the Nashville Predators in the Music City on Monday night, their fifth straight road loss, which drops their record to 1-8-1 in January. Ruff said he plans on putting Stars captain Jamie Benn and Tyler Seguin, who has gone nine straight games without a goal, back together on Dallas’ top line. He also stated that rookie winger Valeri Nichushkin, Dallas’ top pick in the 2013 NHL Draft (10th overall) would return to the ice after being a healthy scratch in each of the Stars’ last two games. But one thing he wouldn’t commit to was a starting goaltender. With Tuesday’s game holding big implications not just for Dallas to end their current malaise but also to remain in the playoff race before the Olympic break in early February, one would have to think that Ruff would go with No. 1 netminder Kari Lehtonen between the pipes. Of course, since things have clearly not gone well this month, Ruff could opt to start backup Dan Ellis against the Wild, who beat the Stars 3-2 in overtime in the Twin Cities on Saturday night. No matter who is between the pipes for Dallas, the importance of the Stars’ second meeting with the Wild in three days can’t be overstated. The Stars currently sit nine points out of the final playoff spot in the Western Conference behind the Wild. A loss to Minnesota will put them 11 markers out and ratchet up the talk that Dallas might be sellers down the stretch. However, a win over the Wild would be a nice first step but still not signal that the Stars are out of their current malaise. Either way, it should be an entertaining contest.